Top 100 VARS list recognizes Value Added Resellers (VARs) who are at the top of the mid-market in revenue. Maumee, OH, June 15, 2017 – Aktion Associates, a leading business consulting and technology solution provider, announced today that Bob Scott’s Insights has named Aktion Associates to its BSI 2017 Top 100 VARS list. The BSI 2017 Top 100 VARS list is an annual ranking of the top 100 resellers chosen from organizations specializing in the sale and implementation of Enterprise Resource Planning (ERP) and accounting software. Selection is based on annual revenue generated by each reseller. “It’s always an honor to be included on this list,” said Scott Irwin, CEO, Aktion Associates. “Our success is a result of our belief to always invest in the best – the best IT providers who deliver the best IT solutions to the mid-market, and to invest in the best people who want to help our customers improve, grow and succeed,” he added. Aktion Associates provides industry consulting services technology solutions to mid-market businesses. Aktion’s ERP deliverables include Infor CloudSuite Distribution, Infor SXe, Infor FACTS, Infor A+, Acumatica, Sage 300 CRE, Sage 100 Contractor. Aktion partners with other technology innovators including IBM, HPe, and Microsoft to deliver a complete technology infrastructure solution. More than 4,500 clients reward us with their partnership and choose Aktion as their technology advisor. 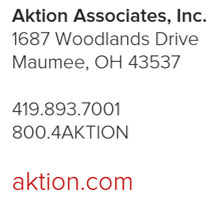 In business since 1979, Aktion Associates Inc., is an IT consulting firm that delivers modern, transformational business technology solutions. Visit www.aktion.com, follow us on Twitter @AktionFigures and connect with us on LinkedIn. Bob Scott has been informing and entertaining the mid-market financial software community with his email newsletters for 16 years. And he has been covering this market through print publications for 24 years, first as technology editor of Accounting Today and then as the Editor of Accounting Technology from 1997 through 2009. He has covered the traditional tax and accounting profession during the same time and continues to address that as executive editor of the Progressive Accountant. DELIVERING BUSINESS TECHNOLOGY SOLUTIONS SINCE 1979.